Being a successful property owner boils down to one thing: maximizing your rental yield. One of the easiest ways to do this is to buy a property relatively cheaply and refurbish it to improve its value. This is true in any market, but particularly so in Madrid. We have found apartments for over three hundred clients, where others were unable to see their potential and transform them into highly sought after properties. Our clients typically achieve returns that are hassle-free and 50-100% above the average long-term Madrid property investor. In short, we have found that every additional 1€ our clients spend on refurbishment adds an additional 1.5€ to the value of their apartment. Contact our partner architect today to learn how a refurbishment could add value to your apartment. Corporate clients and wealthier tenants prefer refurbished properties with modern conveniences such as dishwashers, microwaves and even wine refrigerators. They like elegant bedrooms, extra bathrooms and open living spaces. Luxury, something sorely lacking in most Madrid rentals, increasingly rules the day. The typical Madrid apartment is in an old building. Historically, they were divided into many small rooms and were often dark and rather forbidding. The city has been late to the game, compared to other European capital cities, in embracing the light filled, open spaces that are so popular nowadays. Moreover, many Madrid apartments contain old appliances- most lack dishwashers and dryers. Bathrooms rarely have modern showers and often lack the water pressure and/or boiler capacity for a proper bath. The numbers tell the story. For example, Madrid has only 17% of its properties rented, versus 30% in Paris, 40% in Berlin and 78% in London. Purchasing one of these older apartments and fixing it up allows our customers to earn net rental returns averaging 6-8%. Some earn in excess of 9%. Do you want to earn above average market returns? Book a free consultation TODAY and learn about your options and how to get started. How much does it cost to refurbish an apartment in Madrid? This depends how extensive the refurbishment is. You can do a basic redecoration for lower than 800€ per square meter. On average, people pay 900-1,200€ per square meter for a full refurbishment. Higher end refurbishments cost more. A true luxury refurbishment can run as much as 2,500€ per square meter. If you want to read a detailed account of how much refurbishment costs, click here. Many of our clients ask us the pros and cons of doing a full, premium refurbishment versus a basic rehab. Our recommendation is that if you have the money, go for the premium refurbishment. It will ultimately save you time and hassle and enable you to earn a higher rental return. We have found that any money our clients spend on decorations is totally worth it. One of the most common problems our clients face is lack of boiler capacity. Many old Madrid apartments have limited hot water. This can be a problem in the mornings when everyone wants to take a shower at the same time. Spending a little extra on your refurbishment allows you to invest in a larger boiler and redo the pipes, if necessary. Investing in more expensive furniture keeps your apartment from looking like an Ikea showroom. People will pay more for a luxurious looking flat! How much does one gain by refurbishing an apartment in Madrid? This depends how complete the refurbishment is. Like most investments, the more money you spend, the greater your return. Keep in mind that with real estate investment, you achieve returns two ways: from increased rental yields, and from increased capital gains when you ultimately sell the property. We have found that every additional 1€ our clients spend on refurbishment adds an additional 1.5€ to the value of their apartment. 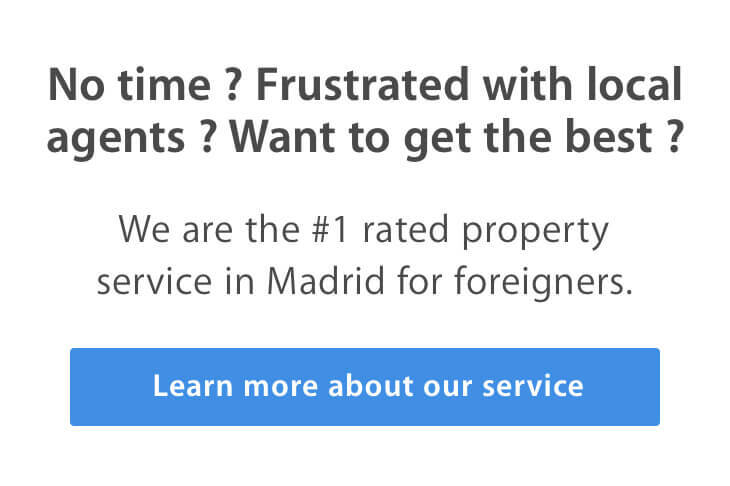 How long does it take to refurbish an apartment in Madrid? Even though Spain has a reputation for moving slowly (which is often earned), full rehabs can be done in a couple of months, providing you have procured the materials in advance. If you’re really in a hurry, and are willing to pay for the extra labor, you can get an apartment fully refurbished in as little as two weeks. This may seem incredible for someone that has redone an apartment in New York City or London, but it is actually possible! As in most markets, everything depends upon how tightly you manage the process. Often times, Spanish contractors can’t or won’t commit to a timeframe. You need to be firm and make sure you communicate exactly what you want and when you want it. Moreover you have to stay on top of the contractors. Whatever you do, don’t tell them you’re not in a hurry or your refurbishment will take an eternity. We work with a partner architect that can help you plan your refurbishment, manage it and keep it on schedule. Contact them today to arrange a FREE CONSULTATION. What return can I expect from my Madrid real estate investment?